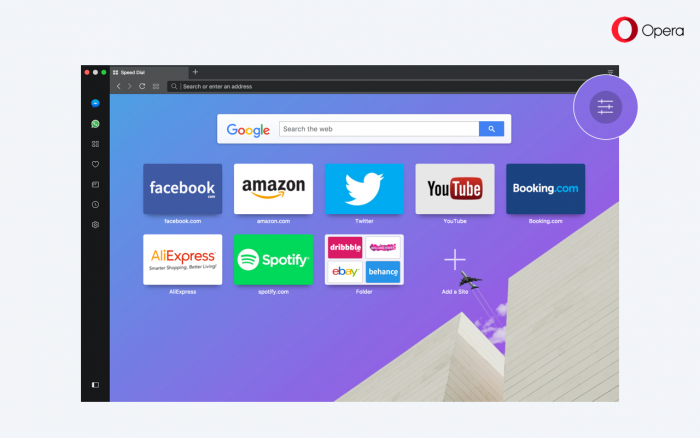 The change log, and the announcement: Opera 46 beta debuts with UI refresh. "The release of Opera 45, code-named Reborn, has generated huge interest, marking a big step forward in the development of our browser. We continue the UI redesign project with Opera 46, that has just landed in the beta channel, and it comes packed with tons of tweaks and fixes. – A new icon for start page customization. – Speed Dial is now dark, when wallpapers are disabled, and dark theme is enabled. – ‘View in bookmarks’ button appears in the bookmarks popup, if the page has been added already. – It’s now easier to move a window, if multiple tabs are opened on macOS. The clickable area between the new tab plus button, and the tab menu button got slightly bigger. – Sound notifications are now turned on, when the sidebar is unpinned. – When importing bookmarks, items from the bookmarks bar will appear in the Opera’s bookmark bar. – Macbook touch bar users can enjoy an emoji-enabled input field. This beta release comes with a little something extra, if you’re looking for the full Reborn experience. 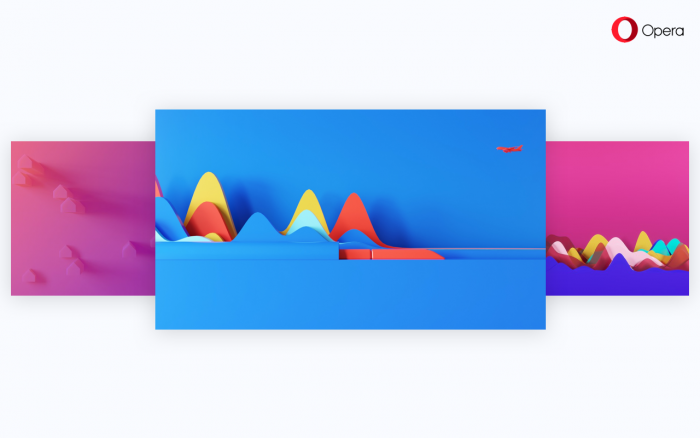 To complement Opera’s new look and feel, we have partnered with top industry artists Umberto Daina, and Feridun Akgüngör to create a custom set of fresh, and cool backgrounds. Also, Opera 46 comes with important fixes for the out of memory bug, when using our built-in VPN, and for another nasty crash, that might appear during startup. Still, you might notice some problems, while using our VPN. Since more and more new users are trying Opera after the Reborn launch, our VPN's usage has quadrupled. We are working hard to add more servers to accommodate the demand. – We fixed the issue of when sync was enabled, the Tabs menu item was missing in the navbar. – We addressed the issue of misbehaving tooltips, both in normal, and private mode. – Video pop out fix for Amazon Prime. – Fixed issue, when the video pop out button was displayed in cases when it shouldn’t. – Seeking quickly through videos could stall playback [Windows]. 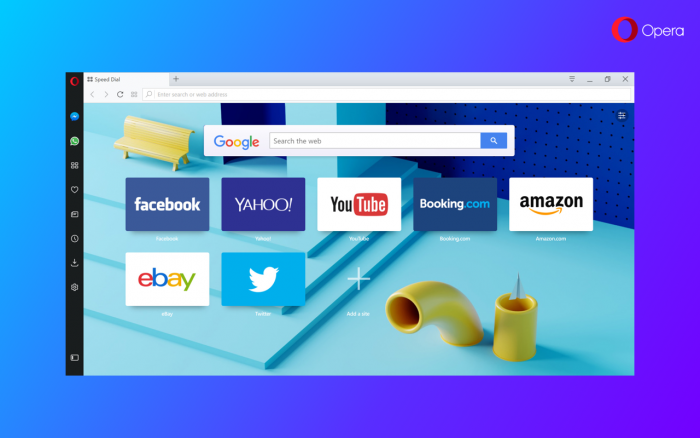 – Opera pins itself back to the taskbar, after being launched [Windows]. – Fixed the full screen video issue with 1px line at the bottom [Windows]. – We have removed the space from the tab bar, when a window is not maximized [Linux]. – Several audio, and video changes, including a fix for a nasty memory leak. – Ad block improvement, and support for tag names. Opera now supports animated PNG, or APNG for short. APNG is a file format, that works similarly to GIF. The difference is, that APNG is smaller and supports both 24-bit images, and 8-bit transparency. It has become quite popular recently, particularly since Apple adopted the APNG file format for iOS 10 iMessage apps. Watch the APNG demo, and learn more about this format. This new beta version comes with updated Chromium to version 59.0.3071.26, and enabled expensive background tabs throttling (opera:flags#background-tab-throttling-max-delay-30s). This technology reduces the processing power required for background tabs, and improves battery life and browsing performance. Try it out yourself with this background timer throttling demo. Enjoy browsing with Opera 46, and stay tuned for more improvements in Reborn this summer." the pop up search-copy is not working here, not responsive. Known issue as far as I know. All of a sudden my Google results pages are coming in 1995 style. The issue seem to happen when you use DPI > 100% on Windows 10. You are correct. I have a 4k tv set at 120%, also a monitor connected at 100% and there it works. I think that caused the confusion getting it to work. I'm using two different keyboard languages on my Windows 10. some times, i forgot to change keyboard language and type another language instead of English in address bar. can you support shortcut or button to change these words to English or another language? – Sidebar extensions on macOS have regained focus, and are working correctly again. – Tweaks, and improvements for live videos in video pop out. 64 bits version has been available since a while. – Chromium** was updated to version 59.0.3071.61. – We fixed cut icons, when dark theme enabled. – The default theme is now as small as possible, to not occupy package space. It works here, so try to update. I have DPI = 125% because of a 4K monitor. Setting it to 100% (default) fixes the issue. Of course this is not a solution for me but at least I know where it comes from now. "Hi, since we’re getting close to Opera 46, we would like to introduce the release candidate. We hope, that it's in a stable-solid build. Let us know if it’s not. We added bunch of new translations, and fixed some bugs." The Chromium has been updated to version 59.0.3071.86.